Beehive huts on Skellig Michael; Little Skellig peaking out of clouds in background. County Kerry, Ireland. Photo: Chris Ryan. 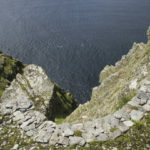 Photographer and writer Chris Ryan visited the larger of the two Skellig Islands off the Iveragh Peninsula in County Kerry, where an early-medieval monastery survives at the edge of the material world. 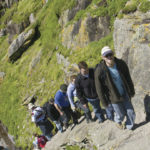 Start at the Dublin offices of Google or Facebook, drive to the southwest tip of Ireland, hop a boat, journey seven miles out to sea, and climb 600 steps clinging to the edge of a steep, jagged island – in only seven hours or so you’ll have made one of the farthest journeys you can make today. You’ll have traveled from one of the hubs of modern, superconnected civilization to a windbeaten perch where for 600 years a handful of intrepid ascetics lived on a knife-edge between annihilation and exaltation. – George Bernard Shaw, from a 1910 letter. It’s easy to imagine why one would seek to escape modern-day society – the shortage of time and solitude, the stresses of hyper-networked life. But the founders of the retreat that astonished George Bernard Shaw rowed away from the Celtic shore in the 6th or 7th century. What social pressures could have felt so overwhelming nearly a thousand years before the arrival of the first newspaper? At that time, bound books were a recent invention and monks could not yet have known the angst of receiving a Facebook request from their abbot. And still, some Christians were contemplating how they could escape the rat race of early-Medieval society and get even closer to God. One of them must have been standing one day at the end of one of Ireland’s glacier-carved peninsulas reaching farthest into the North Atlantic and eyed two rocks rising out of the ocean like sharks’ teeth. The smaller one showed not a patch of earth, its steep cliffs topped with the white of thousands of pairs of nesting gannets. The larger island would have looked nearly as inhospitable, rising sharply up to two peaks six and seven hundred feet above the ocean swell, with just a few swaths of green clinging to some slopes but no sizeable plot of land flatter than the side of an Egyptian pyramid. Which is what I thought when I first learned of this mist-shrouded island off the rocky coast of Kerry. I was intrigued by stories of steep, hand-carved stairways and a tiny community of monks who had lived in beehive huts and faced Atlantic storms and Viking raids. And if the Skelligs were an escape for early-Medieval monks, I wondered how remote they’d feel to a 30-something member of the Internet age. So I made my way to the little harbor of Portmagee, where mornings between April and October a few skippers wait to take visitors out to the islands – ocean permitting. Even today, an attempted visit demands good sea legs. The monks doubtless had some adventures surviving the crossings and landings in their wooden, hide-covered rowboats. But a good swell just as surely sends today’s motorboats clawing up the sides of steep waves and careening down the far sides while passengers cling to railings and huddle under tarps, deflecting walls of saltwater and struggling to keep sight of the horizon. Setting foot on Skellig Michael’s stone jetty after a rough trip felt like a blessing itself: dry, solid ground beneath my feet. At this point, the skipper cast off and left me to explore the ancient outpost for myself. The journey upwards begins with some 600 unique stone steps dug into the steep slope, hand-placed some 14 centuries ago. Here’s where even the most jaded tourist begins to feel like an Irish Indiana Jones. Ascending the ancient staircase, I saw no handrails to balance me or catch me if I misplanted a foot on one of the uneven stone slabs. And after only a handful of steps I was high enough that balance and will were all that was keeping me from succumbing to gravity’s pull. And some have slipped, including two American visitors who fell to their deaths just months apart in 2009. But accidents are actually rare. 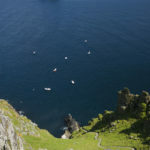 Many who dislike heights visit the Skellig Experience Centre instead, on flatter land back at the Portmagee harbor. Climbing upwards, I felt like I was ascending into another world. The rolling sea receded from my senses, replaced by the lonely wind and the calls of the island’s myriad seabirds. I looked up to gauge my progress and the steps ahead curved gracefully upwards to a distant ultimate stairstep whose threshold seemed to lead to the sky beyond. And all around my stone path was a soft green carpet of cliff plants covering every piece of rock stable enough for a little soil to stick to. 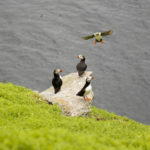 It was hard not to be distracted by the numerous puffins poking their heads out of burrows beneath these plants, launching themselves into the sky and returning to their clans by what looked like improvised crash landings. The orange-beaked divers are fearless around people and endlessly entertaining. But I knew the monastery was still higher, so I tore myself away and continued up towards Skellig Michael’s spiritual pinnacle. At “Christ’s Saddle,” I passed the top of an even more impossible stone stairway, this one closed to the public. It rises from an alternate monastic landing site somewhere over the ledge, far below and out of sight, from where I could hear the faint and distant crash of the Atlantic on the north shore’s rocks. But I continued climbing the stairway to the sky, and on the other side I finally lit upon the ancient monastery, perched on the edge of the island with a commanding view of the Iveragh Peninsula. I ducked through a portal in the outer wall to find myself in the midst of crude but well-crafted structures, assembled from the rocks around me in the 6th or 7th century. Not everything survived the ravages of time, but considering the centuries of weather lashing this exposed rock, it’s remarkable what did. The monks used no mortar to bind the rocks together. The slabs comprising their huts overlap and lock, coming together at the top in a dome and giving them their beehive shape. Inside they are dark and simple and contrast sharply with the light and life outside the door. 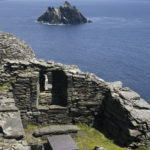 Besides six stone huts, the complex also contains two oratories for worship, a small cemetery, and a more recent, damaged chapel whose one surviving window frames white-capped Little Skellig off in the distance. Looking around, I couldn’t imagine how anyone could live here very long. Experts think fewer than a dozen monks ever lived here at once, surviving on rainwater, fish, seabirds and their eggs, and maybe small crops; there was no fuel on the island for cooking. And as if nature wasn’t harsh enough, Vikings raided the little community off and on beginning in A.D. 795. 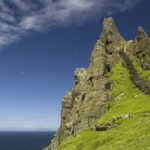 Small groups of early Christians survived on Skellig Michael until about the 12th century, when Church reforms, a worsening climate, or something else entirely caused the monks to move ashore. The site continued to attract pilgrims over the following centuries, followed by two lighthouses and their keepers in the 1820s. Two children of one of the keepers are buried in the tiny cemetery overlooking the sea. Looking out to that ocean, so vast and calm from these heights, and standing among the monks’ enduring structures, it’s hard to wrap your head around the years and centuries that have elapsed or to grasp your place in it all. Sceilg Mhichíl reminds you of your mortality while surrounding you with timelessness, confronts you with the forces of nature while offering tastes of transcendence. I thought of my California life and its vast distance from the world of an early-Medieval ascetic. The monks came to flee secular distraction and get closer to God, while I aimed to escape civilization and get closer to nature. I went for a day and they stayed lifetimes. And still, 1,400 years apart, we shared a similar experience on Skellig Michael: the earthly encounter with a sacred place. Cemetery at the hermitage atop Skellig Michael; Little Skellig in background. Photo: Chris Ryan. Some of the thousands of puffins that reside on the islands from April to August. Photo: Chris Ryan. 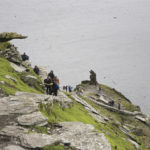 Hikers ascending the southern stairway on Skellig Michael. Photo: Chris Ryan. Visitors near the Wailing Woman Stone. Photo: Chris Ryan. 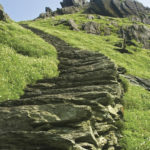 Skellig Michael’s southern stone stairway. Photo: Chris Ryan. 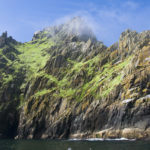 Mist atop Skellig Michael, County Kerry, Ireland Photo: Chris Ryan. 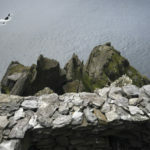 A lone puffin atop Skellig Michael. Photo: Chris Ryan. 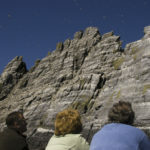 Tourists watching gannet birds on Little Skellig. Photo: Chris Ryan. A view of Little Skellig from Skellig Michael. Photo: Chris Ryan. 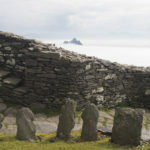 A grave at the hermitage on Skellig Michael; Little Skellig in distance. Photo: Chris Ryan. Prayer platform perched atop Skellig Michael. Photo: Chris Ryan. A platform at the southern peak hermitage on Skellig Michael. Photo: Chris Ryan. The stairway from “Christ’s Saddle” on Skellig Michael. Photo: Chris Ryan. 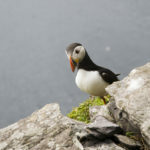 A puffin on Skellig Michael. Photo: Chris Ryan. Amazing photos and great story. Thanks for the inspiration to visit Ireland! 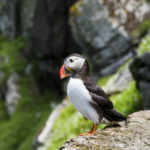 Visiting this fascinating island especially during a puffin visit would be great. Wonderful photos. Do you know the barry twins? They live in REEN. MY MOM AND BROYHER WERE BORN THERE. by Geoffrey Moorhouse (1997). A great read that recreates the daily life of the monks during the entire span of their time in the Monastery . Been to Ireland several times but never been to the skelligs. Your article has inspired me once again to make the trip soon. fado fado, maybe this year? What kind of men were these guys to be able to construct such cleverly designed buildings that have more or less withstood the ravages of time and nature. Skellig Michael is truly magical. I think there is something more there than meets the eye. I find it hard to believe that anyone could live there for extended periods of time- perhaps it was a place where rituals took place.